Although written 28 years ago, the 95 theses (pdf) makes may pertinent points still valid today. 9. Commissioners of evaluations complain that the messages from evaluations are not useful, while evaluators complain that the messages are not used. 35. “Evaluate this program” is often a vague charge because a program or a system frequently has no clear boundaries. 49. Communication overload is a common fault; many an evaluation is reported with self-defeating thoroughness. 75. Though the information from an evaluation is typically not used at a foreseeable moment to make a foreseen choice, in many evaluations a deadline set at the start of the study dominates the effort. 95. Scientific quality is not the principle standard; an evaluation should aim to be comprehensible, correct and complete, and credible to partisans on all sides. 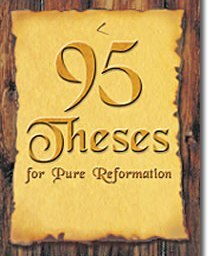 Read the full 95 theses (pdf) – despite this poor copy it’s well worth a read. The 95 theses originally appeared in the book “Towards reform of program evaluation“. Entry filed under: Evaluation reporting, General. Tags: cronbach. Content analysis and word clouds	Granularity – part 2 – still no one cares!